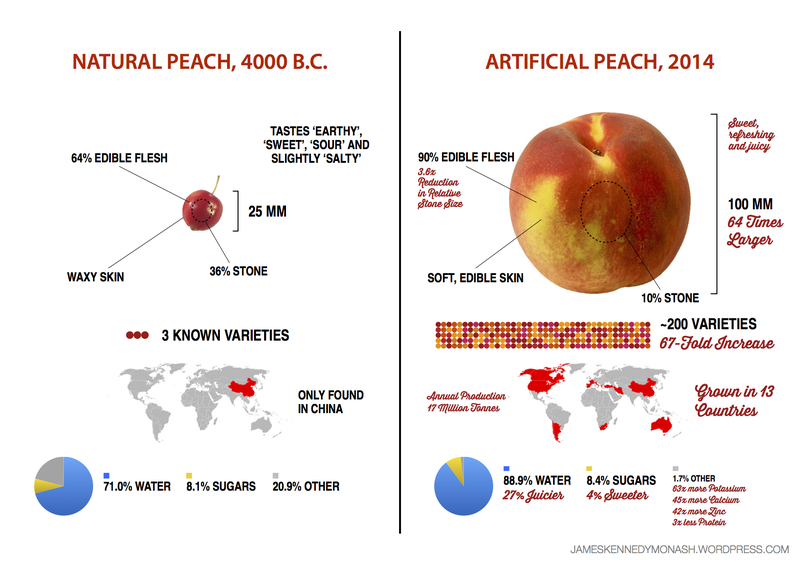 You make a very detailed explanation of what we gained in the modern peach, but in order to make an acknowledged choice one would have to know what it is we lost in the process of domestication and selection for size and sweetness. Needless to say the new peach is tastier and helps sustain the large population we have now, but the category “other”, shrinking from 20.1% to 1.7%, might be an indication of the loss of less common yet equally important nutrients, as is the case for domesticated sweet corn. Would you eat “naturally” grown wild potatoes that are toxic or would you eat “artificially” domesticated ones? Dear Lim, there are 5000 varieties of cultivated potatoes and 200 varieties of wild potatoes, so being more specific would help me make my choice. Also, calling domesticated plants “artificial” is a bit of a strech. I think “domesticated” is more informative. One essential issue is totally thrown aside: Who owns these so called “better peaches”? Also “taste” is much more than just sweetness, but let’s not pick on that, yet. Because it’s obvious those are patented and property of a company like Monsanto: Not the persons who grow them. So the farmer is basically a land slave and all the profits goes to actual owners. That’s a major issue in any genetically modified product: Those are always patented property of a major company. And infertile, you can’t use previous year crop to grow new ones. Either it’s not possible at all (at least on company claims, if not in reality) or it’s illegal (and you’ll get sued for it) or both. So 90% of the income goes to buying fertilizers, pesticides and seeds for next year. How convinient for a company selling all three, much less for the farmer who gets nothing. Also: without all tree these “better peaches” will die: They work exactly like planned: Essentially a huge money transfer machine from farmer to the company. How does that benefit humans outside the company? No no, you really didn’t get this. It’s not a GMO peach made in a lab. It’s a ‘normal’, ‘natural’ peach. Through centuries it has been farmed by farmers and farmers were picking the seeds they deemed best to use each new year so peaches were selected to become better in farmer’s opinion. No company owns them, they’re the ‘normal’ peaches we know, unaware of the fact they are in fact artificially created by the humans throughout the past thousands of years. And it benefits everyone. No one owns them. These are normal peaches that are grown by peach farmers. They were not ‘created’ by a company, they were created by thousands of years of farmers’ choices and decisions and artificial selection… These are the peaches you eat when you go buy some peaches. They’re normal flipping peaches. All of your “points” here… they’re all nothing to do with this. Very cool. Though I’d like to point out that lots of peaches can also be grown in Canada. Okay, I don’t want to sound pedantic here, but after I also noticed some more countries missing I actually researched all the countries that grow peaches to satisfy my own curiosity. There is actually 83 of them! So that really shows how superior ‘our’ peaches are to ‘original’ peaches ;). So I compiled a list of those nations if anyone’s interested. Mr. Kennedy, what image did you use to represent the 4000BCE peach? these food are not gmos, gmos have their genes altered of transplanted by man. If this is science we are in big trouble. And let’s not even get into wild vs domesticated almonds…. Very interesting, especially the part that the modern peach is only 4% sweeter. I have read several times recently the opinion that our modern fruit is so much sweeter than it originally was that it is no longer even healthy to eat, so I really expected an increase of something much more significant, like 20 or 30%. Thank you for putting it into perspective in such an understandable way. An 8,4% of sugar diluted in 89% of water isn’t more sweeter than an 8,1% of sugar diluted in 70% of water. The sweetness of a mixture of compounds is determines by the ratio of sugars in the total mass of the mixture, not by the ratio of sugars to water. This assuming that all other ingredients do not mask the sweet taste. So assuming the “other” ingredients are tasteless, 8.4% sugar is indeed sweeter than 8.1% sugar. Given that the nondomesticated peach has a lot more “others”, which cannot be sweet but may be sour of bitter, I would expect that the dopmesticated peach feels even more than 4% sweeter. You need to change the other “16 times larger” too. Yeah, I agree, it should say ‘domesticated’ or ‘modern’. Artificial doesn’t really mean that. They are not made or produced by human, they are simply transformed by human. the modern peach does not exist in nor was it caused by nature. It is the work of man, over thousands of years of modifying the genome by selective breeding. It is GMO (Genetically Modified).. not GE (Genetically Engineered, in a lab) but GMO none the less. Most foods we eat are Genetically Modified from their original form. This is a reality of the last 10,000 years of human development. Call it Domestication if that makes you feel better, but domestication is not ‘Natural’ either. Wild bananas (musa balbisiana and musa acuminata) are inedible due to large seeds. It was by cross-pollinating these two that one got a domesticated banana. Left fruit is a cherry, not a peach. And 8,4 gr. of sugar diluted in 89 l. of water isn’t sweeter than 8,1 gr. of sugar diluted in 70 l. of water. Well, he doesn’t have a pre-historic peach photo I’m guessing. He’s representing a peach as it once was likely to look. And 8.4% sugar is sweeter than 8.2% sugar. It doesn’t matter what percentage of water there is… all the other stuff in it also dilute the sugar. whoever put this information together needs to take some arithmetic refresher courses. They all add up. The percentages within parentheses together comprise the percentage outside the parentheses. It’s all designed to be confusing, just like most ingredients labels! What would you say are the most natural (undomesticated) fruits/foods we still eat today? Great info-graphic! Even more interesting to see the reactions. 🙂 One little remark: peach is grown in many other European countries (e.g in Hungary) traditionally, too, not only in Mediterranean ,and there is peach produced in Japan, too. So may those 13 countries are the main exporters, but definitely not the only places where it is grown in large scale. It seems it would be useful, maybe for a future project, to distinguish between the contribution of indigenous peoples selection (let’s say, up to the 1400), the contribution of modern technology and science (the last 70 years), and genetical engineering (the last 20 years). You’re right. Actually, the colonisers contributed a great deal to the evolution of corn. They made it more colourful, larger and sweeter. Mister, 100mm = 4 x 25mm. Peach isn’t 64 times larger, not even 16 times. I would like to know the genus and species of the original plant if it is actually still available for comparison. I’m a weirdo–I don’t like the taste of modern peaches–and I’m curious to see if I would like the undomesticated type. The description of the flavor is certainly intriguing. Good luck finding one to eat – let me know what it tastes like! Pingback: ¿Sandías de 5 cm? ¿Cómo eran originalmente las frutas? 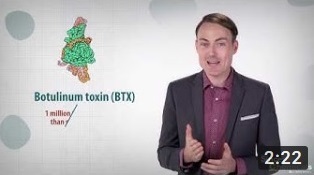 Hi James, you talk about “massive increases in nutrients essential for human survival as well”, and I wonder if you have a source/study/link to show where you found this information ?